Italian yard Baglietto has teamed up with Milanese design studio Santa Maria Magnolfi for the latest addition to its V-Line collection. This 41 metre motor yacht features streamlined exteriors including an uninterrupted sheerline that runs from bow to stern. This tri-deck motor yacht features 300 square metres of exterior relaxation spaces including the superyacht sundeck and spacious foredeck, which features a C-shaped sofa and pool. 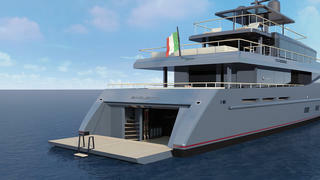 The total interior volume is just shy of 500GT, including an upper deck skylounge and a main deck saloon, with an L-shaped sofa and seating for eight around a square dining table. Accommodation is for 10 guests split between five en-suite cabins, including a main deck owner’s suite, complete with his and hers bathrooms and on board office. Two double cabins and two twin cabins below decks complete the layout. 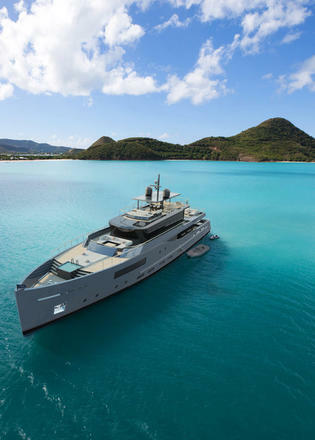 The crew quarters allow for a staff of up to nine people and tender storage options are provided in both the fold-down transom and the foredeck. Power would come from a pair of Caterpillar C32 ACERT engines for a top speed of 15 knots and a cruising speed of 11 knots. 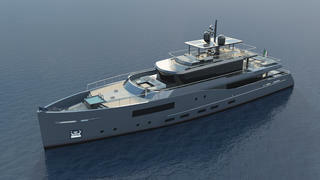 The Baglietto V-Line range was first unveiled at the 2016 Monaco Yacht Show, with designs by Hot Lab and Francesco Paszkowski. 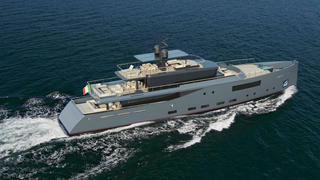 The Italian yard adds that it is also developing a 50 metre version with Santa Maria Magnolfi.